Born in Stockholm in 1862, Hilma af Klint was unknowingly one of the earliest abstract painters. Aside from being an artist, Klint was a practicing mystic, holding seances and channeling ancient spirits. Her occultist beliefs, particularly those of theosophy, formed the crux of her work. Her goal was to gain a spiritual unity by reconciling the duality of spiritual life and the material world. Spiral shapes recur in Klint’s work and symbolize progress toward this reconciliation. 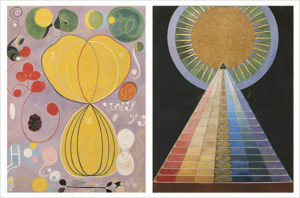 Left: Hilma af Klint, The Ten Largest, No. 7, Adulthood, Group IV, 1907. 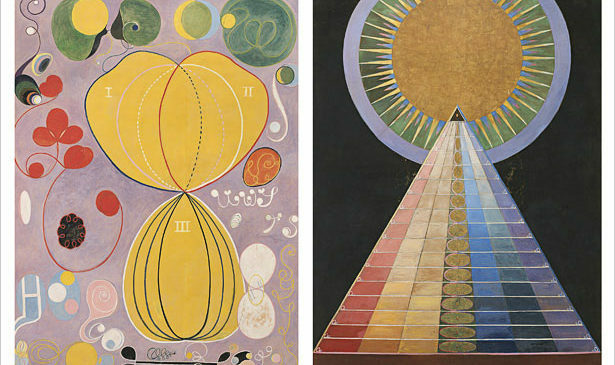 Right: Hilma af Klint, Altarpiece, No. 1, Group X, Altarpieces, 1915. © Stiftelsen Hilma af Klints Verk. Photo: Albin Dahlström. Klint belonged to a group of women artists named, dubbed “The Five”, who asserted that they held a divine connection with “High Spirits” that guided their hands with automatic drawings that transcribed the Spirits’ esoteric messages. In 1905, Klint claimed that these High Spirits told her to create a suite of paintings for an unrecognized, spiral temple. Between 1906 and 1915, Klint devoted much of her time to realizing these paintings and ultimately created 196 Temple Paintings, her earliest and most lauded abstract paintings. Reoccurring themes are present throughout the set of paintings, including the term WU, which is the bonding of matter and spirit, and pyramid shapes and stages of life, which represented the development of the spirit and human form, respectively. Although Klint alleged that her works were painted through divine intervention, they are well-executed and showcase her academic training. Her most abstract pieces, whether truly divinely inspired or realized by her own subconscious, are eye-catching and draw the eye to the crisp shapes and bold contrast in color, while her more figurative pieces are striking in their ability to seamlessly blend figurative forms with abstract elements. Klint has had a resurgence in the past decades. During her lifetime, her status as a occultist artist and her position as a woman in the male dominated art world. After a self-imposed twenty-year embargo on exhibiting her work after her death, the Los Angeles County Museum of Art included her in the seminal show, “The Spiritual in Art, Abstract Painting 1895-1985” in 1986, where she was finally given her due. The momentum garnered from inclusion in this show spawned multiple exhibitions across three continents, with a forthcoming exhibition of her work at the Guggenheim Museum in late 2018. In the 2018-2019 season, Woodshed Art Auctions will be offering several paintings by followers of Hilma af Klint.